Within the Giving Dashboard, the Gifts tab is where you can find every gift that has been processed through EverTrue. For each gift you will see the related details, including billing info, matched constituent, match type, gift amount, giving page, and any additional information. 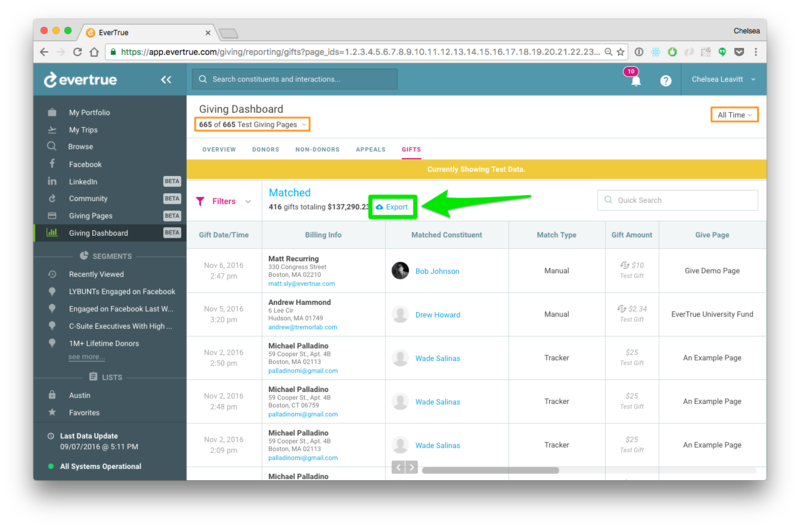 Make sure to pay attention to the pages and timeframe filtering when viewing anything in the Giving Dashboard. More information can be found here. Gift Amount - Find gifts within a certain amount. Matched to a Constituent - Find all gifts that were matched and/or unmatched. Recurring Gift - Filter whether a gift is recurring or not. In addition, don't forget about the pages and timeframe filtering that can be applied to the Giving Dashboard overall. The Gifts tab also includes the ability to manually export your gift data into a CSV file! After filtering down to the set of gifts you'd like to export (or simply not filtering at all to include all gifts), click "Export." Gifts can also be exported by any Owner/Admin of your institution's EverTrue account under their Settings >> Export Data. Here, exports can be manually pulled or set to export and be delivered on a schedule if your institution has set up SFTP file transfers to EverTrue. If you are unsure if your institution is using SFTP, contact your data administrator.